Retail tycoon Mike Ashley, who has tabled a rescue bid for store chain Debenhams, has accused its executives of "a sustained programme of falsehoods and denials". He urged them to take a lie detector test and called for an investigation and the firm's shares to be suspended. 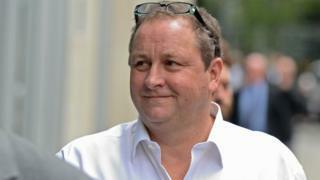 Mr Ashley has offered to inject £150m into the beleaguered department store, as long as he is appointed chief executive. Mr Ashley, who is Debenhams' biggest shareholder, has been embroiled in a battle for control with its board and has already made clear his disdain for its current management. He launched the latest broadside as he waited for a response to his offer to invest. If his bid is turned down, the company is likely to go into administration this week. Sports Direct issued its strongly-worded statement late on Sunday, accusing Debenhams' board members of misrepresenting what had happened in a meeting between the two firms. Sports Direct claims "misrepresentations were made to induce Sports Direct into signing a non-disclosure agreement, locking them out of any ability to trade in the bonds or equity of Debenhams for a period of time". Sports Direct said Mr Ashley and two colleagues had already taken lie detector tests themselves, the results of which "showed without any doubt" that they were providing an accurate report of the meeting. "Indeed, Mike Ashley's score for example was so significantly high as to be considered rare in comparison to others," the statement said. Sports Direct called for Debenhams shares to be suspended while the matter is investigated. Days before a lender-imposed deadline is due to expire, Sports Direct at the weekend offered to underwrite £150m of new equity funding for the retailer, but only if Mr Ashley was appointed chief executive and £148m of debt was written off by lenders, who include banks and hedge funds. The department store chain's financiers are considering the offer, according to City sources. Sports Direct, which owns a near-30% stake in the retailer, confirmed its proposals on Monday and set out that it was still considering a £61.4m bid to take full control of Debenhams. In a stock exchange announcement, Sports Direct said it had until 17:00 on 22 April to announce a firm offer or walk away. While both ideas were being considered, it would pursue only one of them in the event it was agreed, it added. Over the weekend, in a letter to Debenhams, the firm said it was "keen to be a supportive shareholder and financier". But the tone of Sunday's comments makes it harder to see how the two sides can come to an agreement, making the planned administration more likely. If that happens, stores, staff and suppliers would not see any immediate change. However, shareholders, including Mr Ashley, would see their stakes in the company wiped out. Under that scenario, Debenhams is planning a restructuring of the business which would lead to the closure of about 50 stores. The retailer will also attempt to get landlords to cut the rent on the remaining sites, in order to make them more profitable under a company voluntary arrangement. The struggling department store, which has 165 stores and employs about 25,000 people, reported a record pre-tax loss of £491.5m last year. If Mr Ashley's offer is accepted, he would control yet another High Street name. As well as Sports Direct, Mr Ashley runs House of Fraser, Evans Cycles and Flannels. In January, Mr Ashley joined investor Landmark Group to vote the retailer's chairman and chief executive off the board. Video Can Mike Ashley save debt-laden Debenhams?